The Mexican celebration Dia de Muertos is a holiday honoring loved ones who have passed, with offerings, gatherings and prayer. The Duluth community celebrates with a Day of the Dead Exposition, an inclusive, cross-cultural event with an opening reception at Zeitgeist Arts on Nov. 5, from 5 - 7 p.m.
A religious, public holiday in Mexico, this reverent celebration has been shared by the Latin diaspora and adopted across America and the world. 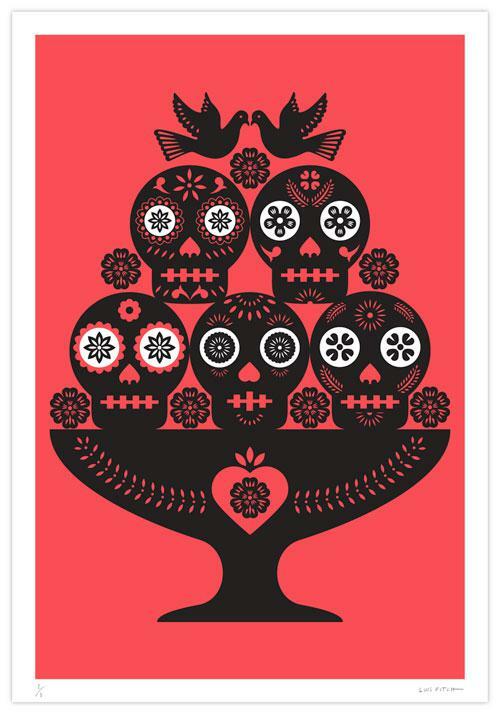 This year the national Mexican holiday Dia de Muertos falls on Oct. 31 - Nov 2. Over the three-day holiday, marked on the Catholic calendar there will be community gatherings, parades, puppetry, art exhibits and the traditional ofrendas, alter offerings to honor the dead. Artists participating in the Zeitgeist Arts exposition are famous Mexican-American and Minnesota-based artists: Renan Cruz Dr. Swami Lucky Dougie Padilla, Mary Plaster, Jimmy Longoria and McKnight Visual Artist Fellow Luis Fitch. The exposition will also share student works from Duluth Lowell Elementary, Nueva Vision Spanish Immersion program. On Radio Gallery, we are joined by Minnesota based graphic designer, commercial artist and McKnight Fellow, Luis Fitch. Originally from Tijuana, Mexico, his recent work is tells stories violence and tragedies in his homeland, adding a bright and vibrant cultural context. His work graces the walls of museums, large scale ad campaigns and even the Minnesota State Lottery. He joins us to share more about his recent work. In addition to the exposition, the Spirit of Duluth Dinner and Film series event celebrating Mexican culture and cuisine is at Zeitgeist the following Monday, Nov. 12. The power of Lake Superior is on display in the works of Karen Owsley Nease, all part of the Downtown Duluth Arts Walk happening this Friday. The Joseph Nease Gallery is showing her exhibition "Elemental Forces," a series of oil paintings focusing on water, up through Saturday, Nov. 3. After years of creativity, connection and participation, "122 Conversations: Person to Person, Art Beyond Borders" has arrived in Duluth at the Tweed Museum of Art. Minnesota artist Anne Labovitz has developed a beautiful cross-cultural dialogue and expanded the possibilities of understanding and peace for Duluth and our International Sister Cities around the world through this traveling exhibition. This weekend is the Duluth Superior Pride Festival, four days of celebrating the rich LGBT community in the Northland. Thursday is the Duluth Mayor's reception at The Depot and Friday evening Zeitgeist hosts the DS Pride Exhibition with a reception at 7 p.m. The Pride Exhibit includes work from 11 local artists and will be on display through September. We spoke with local artists Janelle Turner Miller and Stacie Renee of Warrior Printress, an independent printing company in Duluth.